Staff Sargeant Brian Claughsey, USAF, is pictured in desert camouflage with considerable equipment and a bit of refreshment. Brian Claughsey has always been good at defense. As a high school varsity hockey goalie for four years, he was used to protecting the goal and fighting off slapshots. In September 2015 however, he was fighting off something far more deadly serious than slapshots. 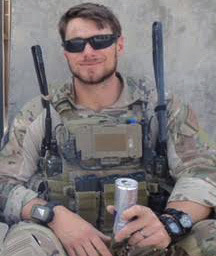 In the process he was awarded a Silver Star, the highest medal for combat valor not unique to any specific service branch and the third highest military award exclusively for combat valor. In 2012, then a sergeant, Brian applied for and successfully completed a two-year program to become a Combat Controller (CC). Combat controllers are battlefield airmen assigned to special tactics squadrons and are among the most highly trained special operations forces in the military. To say the training is rigorous is an understatement. According to Task and Purpose a news site for veterans, just the initial two week physical testing results in a dropout rate of 75%. It is further estimated that between 90 – 95% will wash out before the training ends. They endure the same training that Special Forces teams like the Seals and Green Berets do, but in addition, the combat controllers must become FAA certified air traffic controllers. They are embedded with other branches of the military’s special ops forces and command, control, and direct air traffic from remote and hostile areas. Their motto, “First There” according to an AF.mil factsheet, confirms their “commitment to undertake the most dangerous missions behind enemy lines by leading the way for other forces to follow.” Their role is threefold: global access, which is locating places where airstrips can be established and setting them up, providing air support to ground troops with precision strikes, and personal recovery, which includes humanitarian rescues. 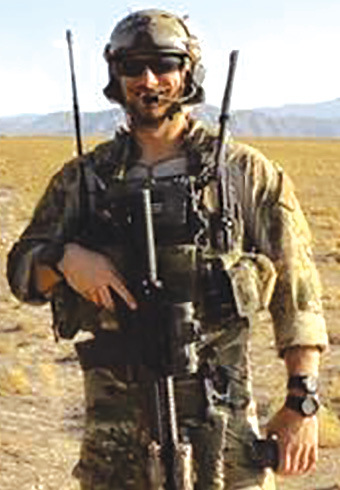 Upon completing his CC training, Brian was assigned to the 21st Special Tactics Squadron at Pope Army Airfield in North Carolina. He has been deployed twice: once to Kuwait and then to Afghanistan. While in Afghanistan on September 30, 2015, he linked up with Army Special Forces soldiers to liberate the northern provincial capital of Kunduz, which was the first major city to fall to the Taliban since 2001. According to the narrative which accompanied the award of his Silver Star medal, Brian volunteered to ride in the lead U.S. lightly armored convoy vehicle (a pickup truck) to assume close air support duties. His convoy was immediately ambushed upon entering the city. Brian took control of the overhead Lockheed AC-130U gunship and directed precise fires to the elevated enemy strongpoint, which preserved the survivability of the convoy. When the gunship visually identified an enemy ambush point ahead, Brian confirmed friendly positions and coordinated an attack to eliminate the enemy position before an ambush occurred. During a second ambush on the convoy, he coordinated friendly force locations and directed “danger close” strikes 70 meters away from them with the AC-130U. A third ambush occurred when a vehicle-borne improvised explosive device was detonated, forcing the convoy to stop in the middle of a four-way intersection and six insurgents opened fire with PKM (Russian made) machine guns. Brian credits two Green Berets with saving his life by putting their vehicle between his truck and the insurgents while he called in precise air strikes, thereby halting the enemy flanking maneuvers and eliminating the enemy. Arriving at the police compound in Kunduz, the Special Forces teams came under relentless attack on three sides with mortar, rocket-propelled grenades, and machine gun fire. Brian got to the closest position to the mortar point of origin, correlated the enemy position with overhead F-16 aircraft and controlled strafing runs on the position that neutralized the mortar site. Putting himself at risk to better control air support, Brian climbed to the roof of the building and with another Special Forces soldier took on intense small arms fire for an hour from an enemy Command and Control (C2) node. During this time, he suppressed the enemy with his personal weapons while another CC controlled a “danger close” F-16 strike on the west side of the compound. With no regard for his own safety and rounds impacting within a meter of his position, Brian exposed himself to direct enemy fire in order to mark the enemy position with his grenade launcher and laser marker three times for an air-to-ground strike while directing the friendly force out of the danger area. He directed two 500-lb. “danger close” bombs to neutralize the C2 node and end the coordinated attack on the police compound. Over the course of the intense firefight to liberate Kunduz, Brian expertly coordinated 17 separate close air support engagements, resulting in 47 enemy killed in action, no civilian or friendly casualties and ensuring the safety of 36 U.S. Army Special Forces personnel and 110 Afghan partner forces during the 96-hour battle. Indeed, when advised of the Observer’s choice of him for the first Suffield’s Pride column, he replied that “it is certainly humbling given the caliber of people that Suffield has produced over the years.” And while his SHS classmates who voted him class clown might not have realized it, I’m guessing his hockey teammates would not be surprised at his mettle. While the Silver Star is Brian’s most prestigious military honor to date, it is not his only one. He has also been awarded the Bronze Star medal, an Air Force Commendation Medal with one Oak Leaf Cluster, and an Air Force Combat Action Medal. In 2013, Brian also received the Leadership Commandant’s Leadership Award, and in 2015, he was the 21st Special Tactics Squadron NCO of the Year. Since his bravery in Afghanistan, Brian has been promoted to 2nd Lieutenant Special Tactics Officer. He is presently assigned to Mildenhall AFB in England, where he continues to train for upcoming missions and where he lives with his wife and two children.